Wyoming studio Carney Logan Burke Architects has created a small, rustic retreat for one of its firm's principals on the site of a log cabin that was destroyed in a forest fire. The Phoenix is situated on a 10-acre (four-hectare) site on Casper Mountain in central Wyoming. 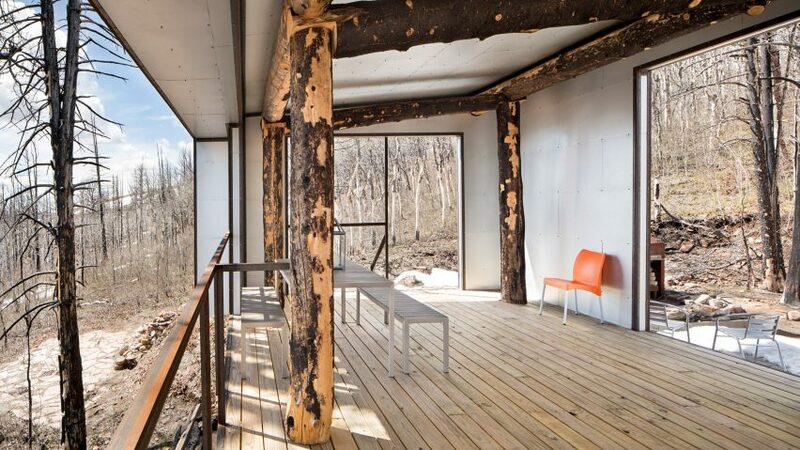 The cabin is named after the well-known bird in Greek mythology that is cyclically reborn. "Associated with the sun, a phoenix obtains new life by arising from the ashes of its predecessor," said Carney Logan Burke Architects, a local firm well known for its modern-style dwellings in rugged settings. The single-room dwelling – built for design principal Eric Logan and his family – replaces a classic log cabin with a gable roof that was destroyed by a forest fire in 2013. Built in the 1970s, the former cabin was constructed atop a building pad on a mountainside blanketed with aspen and pine trees. 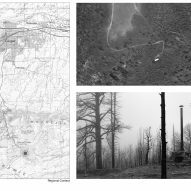 "In 2013, human-caused fire swept through the southern slopes of Casper Mountain, destroying the forest and 36 structures," the studio said. 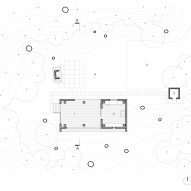 "The architect's family retreat was lost." The new structure was erected at the edge of the old building pad, and is elevated off the ground using short, concrete pillars. The ruins of a fireplace were retained, to help preserve the memory of the site, and serve as a gathering spot and a vertical marker for the site. The cabin's shell is made of galvanised metal, and interior walls are sheathed in plywood. 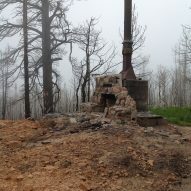 Charred logs were incorporated into the structural system. "Standing dead charred timber was incorporated in the structural system to connect the new building with the forest and to create a lasting reminder of the story of this place," the team said. Encompassing 1,000 square feet (93 square metres), the new building is divided into open and closed zones. A covered porch affords sweeping views of the landscape through large, rectangular openings. The closed zone offers shelter from the elements, along with storage space and an area for meal preparation. A wood-burning stove warms the small room. The off-the-grid cabin is meant to serve various functions. 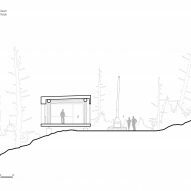 "On a site with challenging accessibility, no electricity, no water and no cellular service, the Phoenix is conceived as a folly in the landscape – a viewing platform, a fire lookout, a shady spot for a picnic, a remote crash pad for limited stays, a place to become detached, a place to commune with the landscape, a place for contemplation," the studio said. Carney Logan Burke Architects has worked extensively in its home state, with projects including a barn-shaped guest house made of reclaimed wood, and a mountainside home that was built around a huge boulder. Photography is by Gibeon Photography.